All-rounder Gareth Berg produced a match-winning performance as Hampshire began their Royal London One-Day Cup campaign with a thrilling two-wicket win over Sussex with four balls to spare at Hove. Sussex looked favourites when Hashim Amla was sixth out for 63 to leave Hampshire needing 118 from 15.5 overs to overhaul Sussex’s 250. But Lewis McManus and Berg thrashed 59 from 37 balls for the seventh wicket and although McManus was caught behind in the 41st over with 57 still needed Berg unleashed some powerful shots and farmed the strike effectively, although he should have been run out on 47 when he slipped backing up too far only for David Wiese to miss with his throw at the stumps. There was another twist when Berg, who had earlier taken 3 for 51, was caught at deep mid-wicket in the 47th over off Ollie Robinson for 65, made from 37 deliveries with eight fours and two sixes, to leave his side needing 15 off 20 balls. 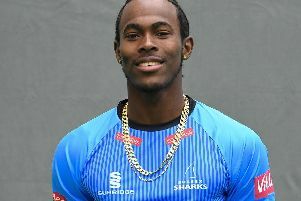 But Mason Crane and Reece Topley kept their nerve and when Mason drilled Robinson back down the ground for a precious boundary, it meant three were needed off the final over. Topley scrambled a leg bye off the first ball from Ishant Sharma then Crane crashed the next to the cover rope to seal victory. Amla had set things up with 63 from 83 balls and Sussex were to rue that they dropped him on 35, when Sharma spilled an easy chance at mid-off, and again on 54 when the same player dropped a more difficult opportunity off his own bowling. Amla could only hit three boundaries but he held the innings together and allowed McManus and Berg to take the initiative. Earlier, Sussex batsman Harry Finch had made his maiden one-day hundred a fortnight after scoring his first Championship century on the same ground. Wicketkeeper McManus dropped him on 12 off Topley and then on 98 Crane put down a sharp return catch. Finch celebrated by hitting his seventh boundary off the next ball to move to his hundred. He was eventually bowled by Berg for 108 off 142 balls with eight fours and two sixes, both off Berg. Topley, playing his first one-day game for more than a year after a succession of injuries, picked up Wells in his first over but Finch and Luke Wright, who was playing his 200th List A game, added 105 in 22 overs before Wright (56) top edged a sweep at Crane. David Wiese, with 29 off 20 balls, hit out towards the end of the innings to take Sussex to a total that always looked competitive on a pitch on which it became increasingly difficult to time the ball. Robinson picked Rilee Rossouw (0) and James Vince (9) in an excellent new-ball spell and Sussex seemed to be in control before McManus and Berg turned the tables. Jason Gillespie, Sussex Head Coach, said: "It was a great game and we had opportunities to win it. When you analyse it, we probably left a few runs out there but for 35 overs of their innings I thought we bowled well and were going to defend that target. But fair play to (Gareth) Berg, it was a pretty special knock, he played beautifully to get them over the line. "Overall I am pretty happy with our efforts and it was a special moment for Harry Finch to get his first one-day hundred. It was quite a tough pitch to bat on but I thought he showed a lot of composure." Vince, the Hampshire captain, said: "In the end it took a pretty special innings from Gareth to win it for us, that proved to be the difference. I thought it was a great game and it's always nice when you win the tight ones like that. Credit to Mason Crane and Reece Topley down the order too, they gave Bergy good support."